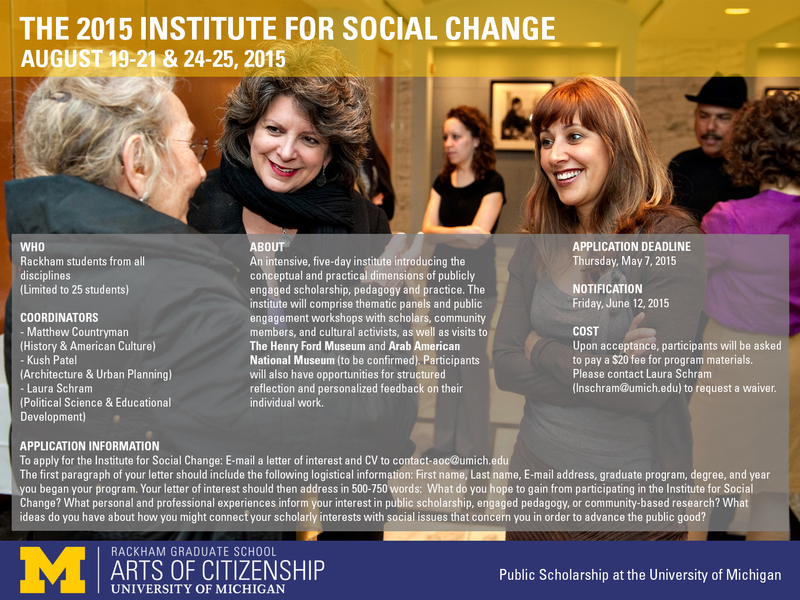 Institute for Social Change – who speaks and acts? Planned and coordinated the 2014 and 2015 Summer Institutes for Social Change at Rackham Graduate School with Drs. Matthew Countryman (2014, 2015) and Laura Schram (2015). 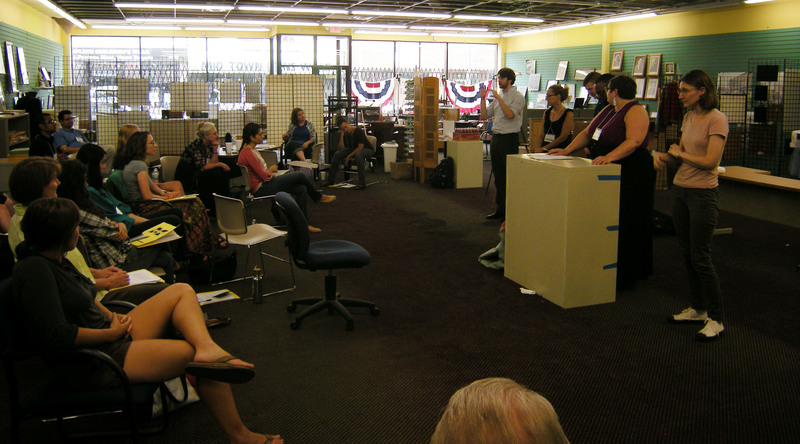 The Rackham’s Arts of Citizenship Institute for Social Change (now an activity of the Program in Public Scholarship) has long constituted a multidisciplinary venue for exploring the conceptual and practical dimensions of public scholarship. 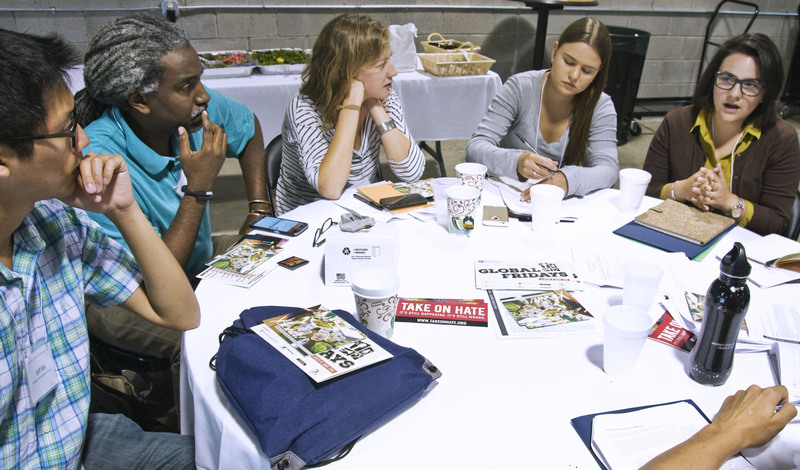 Each year, this summer institute provides up to 25 socially motivated graduate students an opportunity to discuss questions and ideas in the context of place-based politics as well as community-centered careers. As a Ph.D Candidate, I did not see my involvement with the Institute as disconnected from my doctoral work. This common formulation, I argued, resisted an understanding of engaged, public scholarship as an intentional practice through which we build knowledge across sites, experiences, and types of expertise. Such a formulation also limited the potential relevance of one’s dissertation for a range of meaningful careers, both within and outside the academy. In my role as the coordinator of the summer institutes in 2014 and 2015, I positioned the Institute not as an exclusive moment in graduate education, but as a generative framework for engagements with multiple communities and locations of scholarly activity.